The Terry McEachern Internal Auditor of the Year Award was established in 1995 by Royal Credit Union to recognize Terry McEachern as the founder and first president of the Association of Credit Union Internal Auditors. In 1989, as RCU’s internal auditor, McEachern organized a group of auditors in her area to meet and share ideas about internal auditing. She served as the association’s first president and served on the ACUIA board of directors for more than ten years. This award is presented to an internal auditor who has made a significant contribution to the internal audit profession and to the credit union industry. The recipient of this award has demonstrated personal and professional leadership in serving the industry, profession, and community. A committee reviews the award nominations and announces the winner at the Annual Conference business meeting. Supervisory and Audit Committees, Credit Union CEOs, Credit Union Internal Auditors and anyone familiar with the nominee’s qualifications, may submit nominations for this award. 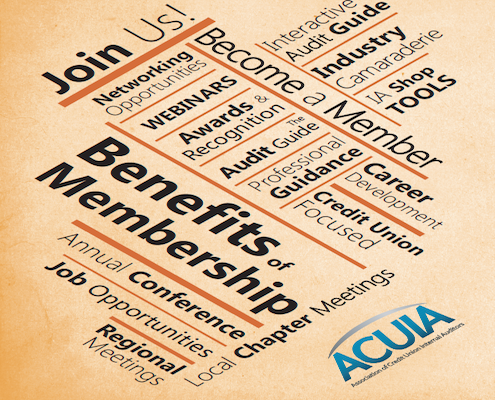 Nominees must be an ACUIA member and currently employed as a credit union internal auditor. See the guidelines for more information about submitting a nomination for this award. Deadline for nominations is April 30 of each year. In 2016, the ACUIA Board unanimously voted to rename this award the “Randy Manscill Excellence in Service Award” to honor Randy’s lifetime of commitment to ACUIA and the Internal Audit profession. As an early member of ACUIA Randy volunteered and served in a multitude of capacities including Board Chairman, Regional Director, and a Chapter Coordinator. He selflessly worked to mentor his fellow auditors. This award reflects the spirit of Randy's selfless service to ACUIA and the profession. The Excellence in Service Award is an award given each year to an ACUIA volunteer who exemplifies the spirit and dedication of volunteer service in going above and beyond the call of duty. The recipient of this award is selected by the ACUIA Chairman for their outstanding volunteer service for that year. This award is presented at the Annual Conference. A Best Audit Practice is any auditing routine/procedure/audit program step/or audit technique that you have developed that contributes to an effective audit or covers an administrative function for your department. If you or someone else thinks it’s a good idea, then share it with your fellow auditors. The authors of the top three entries chosen as the very best of all practices submitted will receive one of three gift certificates in the amount of $100, $50 or $25, as well as a plaque to recognize your contribution. Winners will be announced at the Annual Conference. However, you do not need to be present at the Conference to win. The Best Practice Committee evaluates all entries. Criteria for selecting the winner will include originality, ability to implement or use/reuse, adaptability to the credit union size, overall value to the credit union, and the value to the audit department. Entry deadline is April 30. To submit that great idea, download the printable nomination guidelines and send your submission to ACUIA. It may win you fame and fortune! In 2013, the ACUIA Board renamed this award the “Pat Richey Best Article of the Year Award” to honor Pat’s commitment to ACUIA and the Internal Audit profession and standards through her countless article submissions to The Audit Report magazine. Over the years Pat volunteered with ACUIA in many capacities including serving on the Board, as a Regional Director, as a Chapter Coordinator, and mentoring fellow auditors. Each year the article is selected by the magazine's editor, as the best published article from the quarterly magazine, The Audit Report, and from articles published on the ACUIA web site. All articles from these two sources are automatically considered for this annual award. Eligibility for the award begins after the Annual Conference and ends several weeks before the subsequent conference. Topical Selection: The topic should be of current interest to the majority of credit union auditors. Easy to read: The average/experienced internal auditor should be able to comprehend the material. Jargon and acronyms should be avoided or clearly explained and then with minimum use. Helpful: The article should be helpful to the majority of credit union auditors. The reader should be able to incorporate or use some information in their daily work or audit plan. Application: The material is widely applicable to all credit union auditors. Difference between federal or state chartered credit unions should be defined.The award winner is announced at the Annual Conference business meeting. The winner receives a plaque and recognition in the ACUIA publications. For more information about publishing an article in The Audit Report Magazine or on the web site, contact the ACUIA office. Reprints are not eligible for Article of the Year award consideration. 2007 Laymen Grant Security Breaches: Do You Know What to Do? Established in 2013 the ACUIA Lifetime Achievement Award was created to recognize individuals whose tireless service and commitment to the assoication has left an indelible mark. ACUIA has grown and prospered over the years due in large part to those members who have volunteered their time and talent to serve the association. One of the vital roles that helps create a cohesive connection between our association and members is that of Regional Director. To recognize members whose past service as a Regional Director for at least one two-year term, they are presented with an award at the Annual Conference.